Home » Cheezy Americana » Two heads are better than one shrunken head. Possibly. ← The Life of Pye: Puss in boots, one year later. Just a short 30-minute drive from Stonehenge II, and the Giant Stone Heads in Ingram, Texas is Bandera. Some of you may remember my post Braless in Bandera, The Cowboy Capital of The World (sorry guys, it’s not what some of you may be hoping for – at least not in my case). In addition to the apparently many braless ladies in Bandera, there is a museum. Ah, but you know me so well! I wouldn’t tell you all about just any museum. No, no, I only tell you all about the weird, the wacky, and the wonderful! This museum is a combination of both weird and wacky. So much so, I will have to tell you about it in two, maybe three, posts. I’d been in Bandera a couple times before I realized the sedately named Frontier Times Museum was a welcome journey into the weird and the wacky. Oh sure, they have some old frontiery stuff there, but really, do I care about that? Not so much. Then someone told me about the “Two-headed Things Museum” in Bandera. ‘Two-headed things’?? My people!! Where is this? How could I have missed this? Ah, yes. I judged that book museum by its cover title. 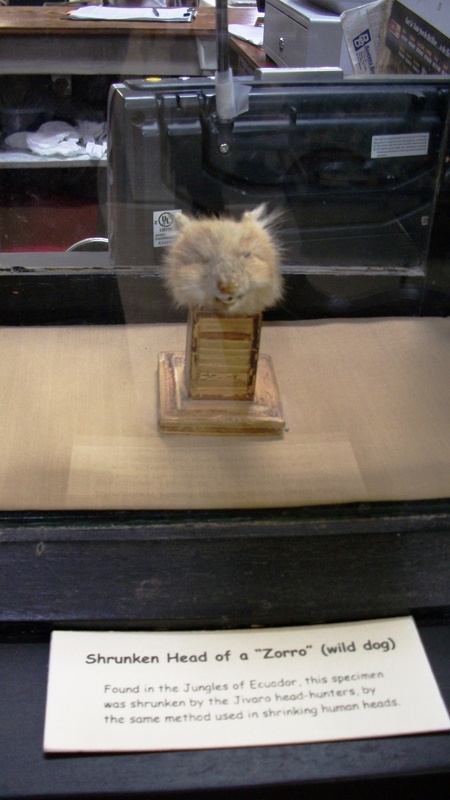 She kindly pointed to one two-headed thing, and then said there was another two-headed rodent – somewhere in the museum. She also pointed out some shrunken heads. Holy Shrunken Grapes, Batman! 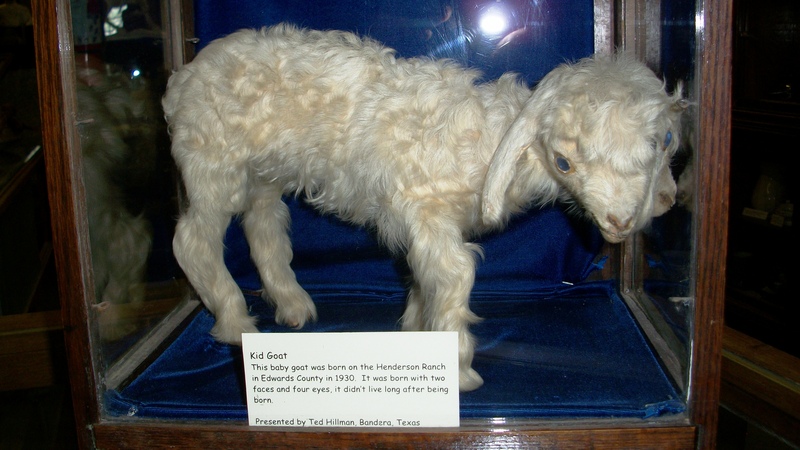 Two-headed goat, born in 1930. 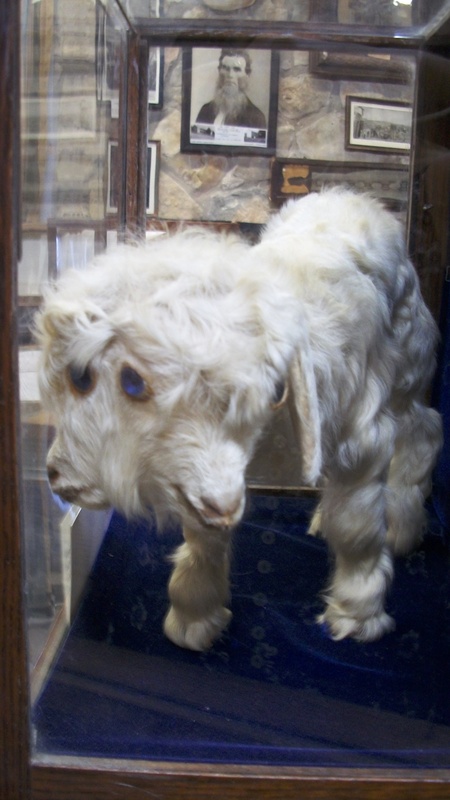 Goat born with two heads and four eyes. 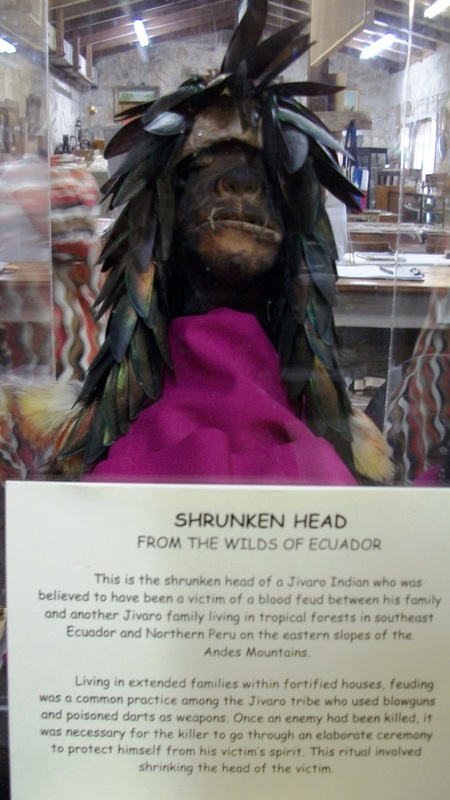 Thank goodness shrunken heads seem to be extremely rare. This is the first I’ve seen in Texas. Come to think of it, it’s the first shrunken head I ever seen. I’m good with that. These were kind of creepy, and a bit sad. 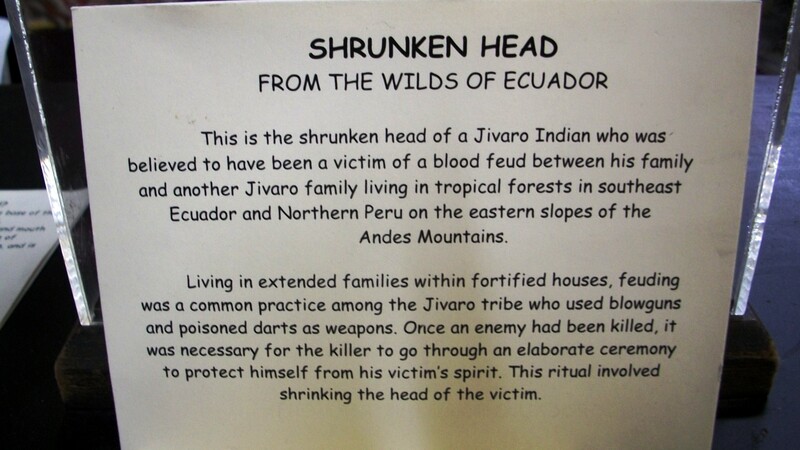 The shrunken head of a Jivaro Indian. This is an extreme closeup — the head was about the size of my fist. About the shrunken head pictured above, because why type all that when I can just post the photo? The shrunken head of a wild dog. It looked a lot like some kind of mouse. I’ll tell you, I looked ALL OVER that very crowded (with stuff, not people) museum looking for that two-headed rodent. No where, NO WHERE is it in that museum. Alas, I think hunting for the elusive two-headed rodent was a ruse to get me to look at the rest of the stuff. Just one of the many rooms in the Frontier Times Museum in Bandera. This is just one of many rooms full of awesome wackiness so there will be another post or two to follow. There is A LOT of stuff in there. Can’t wait? Want to look for the elusive two-headed rodent yourself? 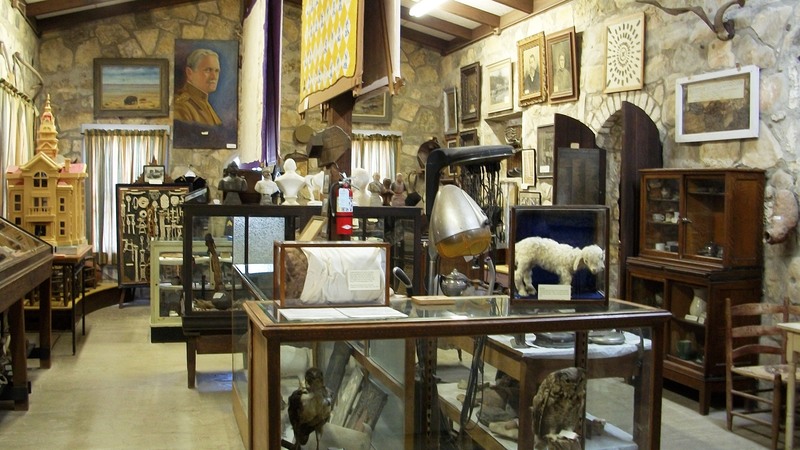 Visit the Frontier Times Museum at 510 13th St., in Bandera, Texas. Post 2: Only the best dressed fleas for MY pets. The goat looks like something out of the “The Thing” movies. Don’t let it out from under the glass! The headline will read “The Zombie Apocalypse started in Bandera, Texas!” You saw it here first.